A special candle for a very special bride & groom. Fitting in with their theme of white orchids and silver colouring, we designed a large candle to suit the wedding at St Mary's of the Angels. The text with flourishes matched that of the wedding invitations and the artwork was provided by the bride. The 300x95mm candle is hand-crafted in New Zealand and decorated with five large wax orchids with yellow/orange and silver highlights, arranged on a matt silver band with fine silver edging and five sparkly Swarovski diamante crystals. The long slim taper candles measure 260x9mm and feature matching silver bands with crystals. All embellishments are handcrafted in wax in our studio, and lacquered for extra protection. The candles are presented carefully packaged in a quality gift box. Lisa and Antonio kindly shared their wedding photos - see Gallery. 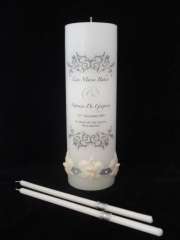 Please contact us to discuss your own candle requirements.